I have found chisels from 1/4" to 3/4" at the dollar store. Every shop needs a cheap chisel to pound on for those jobs when a good chisel is too good to use. Plus these are a good source of high carbon steel for scrapers and such. A special grind may make all the difference is getting the cut that stops a lot of sanding. Pliers come in handy and I have found a few at the dollar store. Not the fanciest but they do most jobs for which you need them. 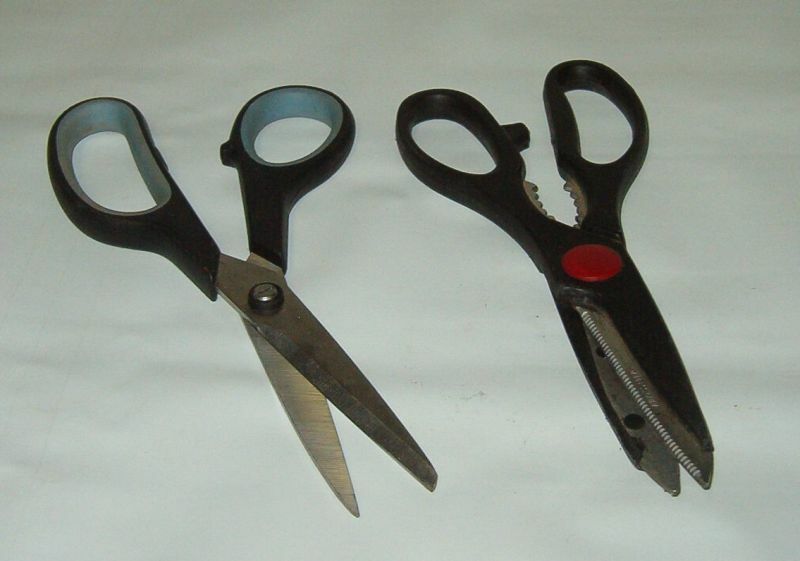 Scissors of various descriptions are handy for cutting everything from string to veneers. 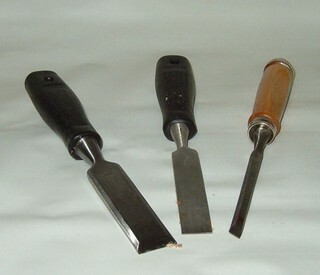 At this price they are a great tool for cutting sand paper to size. One of the rules of wood working is "you can never have too many clamps." I have found several types at the dollar stores. 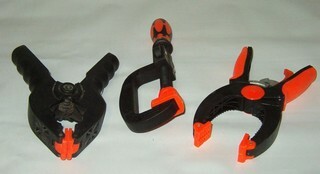 These are various spring and related plastic body clamps, good for light work. This little 4" one hand clamp is a great find. Hint: for things like this it is best to buy one and try it. Then go back for more if the quality is good. In this case, surprisingly, it was. 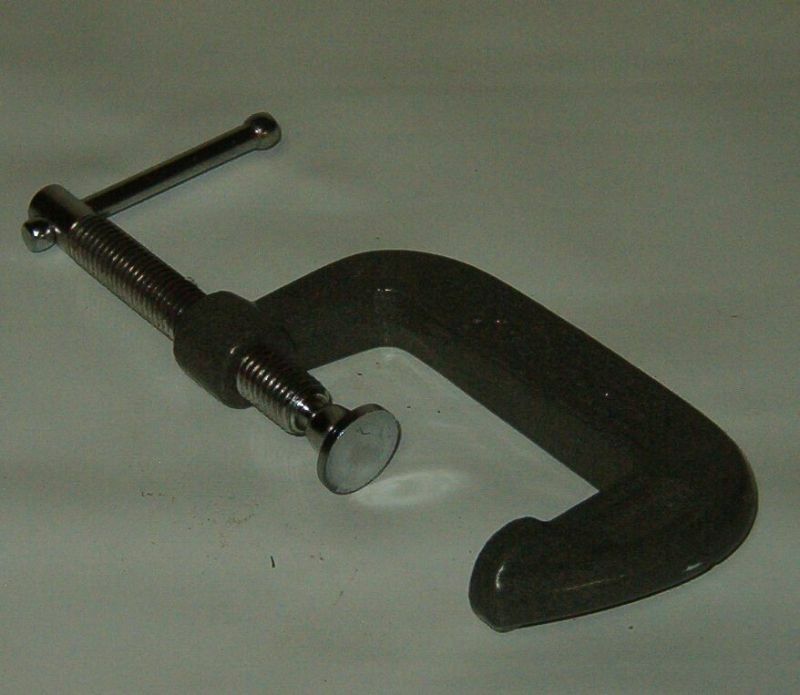 On the other hand, this 2" c-clamp was obvously a great buy. 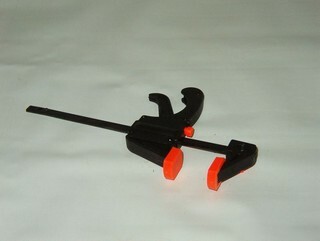 It is solidly built and moves well on the screw. Thankfully I got a few when I saw them because they sold out and were not restocked. Likely it was a close out somewhere.